Many people are intimidated by the pressure cooker, but there is so much to gain from it that it is worth trying. I found the pressure cooker an essential tool for time-saving, and flavour enhancement. The concept is very simple and it is all about physics. You are not only cooking at high temperature but also at high pressure, as a consequence the food is cooked much faster. The cover of the pressure cooker sealed the air inside the pan. When the vapour is formed instead of evaporating away, it is trapped inside increasing the pressure inside the pan. So you can imagine, all those particles of water under pressure will retain and push all the flavours inside the food making it even tastier. Don’t be afraid of the noise it makes, as long as you fill it not more than 2/3 and properly close the valve, everything is ok. When you are finished cooking just release the valve gently to gradually release the pressure. The meat would normally cook in 30 minutes instead o 2 hours. The potatoes 5 minutes instead of 20 minutes. Other vegetables in 3 minutes instead of 10 or 15. One of the best uses of a pressure cooker is to make homemade stock. Instead of boiling chicken or beef bones for hours, you only need 35 minutes with a pressure cooker and the flavour will stay locked in the broth under pressure. The same applies for Bolognese sauce, a complete dinner cooked in 35 minutes. 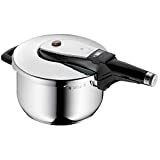 With the pressure cooker I, cook pulses (the edible seeds of pod-bearing plants) such as beans, chickpeas, and brown rice. They come out chewy and creamy but still firm and full of flavour. You could use the Pressure Cooker also to make a Risotto, but at your own peril! I recommend WMF Perfect as I had it for 25 years, used it in 6 different countries and I never had a problem with it. It is easy to use and it is strong. Why I love it more than other brands: You can buy different size pans to use with the same top. You can cook small portions of baby food or a large bone marrow for brown stock using the same top. I have heard a lot about Instant Pot but I really do not need an additional appliance in the kitchen. My pressure cooker is stored in the cabinet with all the others pots and pan and does not occupy space on my kitchen counter. Also included in the pressure cooker there is a basket if you want to steam your food. Perfect for steaming any type of vegetables. Potatoes are steamed in few minutes. I also steam my Tuna Loaf and you can find the recipe here. If you are concern about safety you can buy the Pro or Ultra type that has a more sophisticated and easy to use closing mechanism. There are so many different types and designs, it is just a matter of budget. The pan comes with an instruction book and as long as you follow the basic rules, it is very safe. 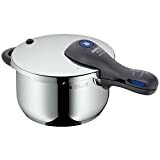 Never cook with less than ¼ of Litre of water and fill it at no more than 2/3 of its capacity. When you build up the pressure keep high temperature. Once the pressure is up, lower the temperature to cook for the required time. 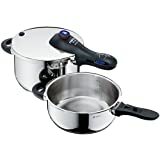 Here is a list of recipes I make with the pressure cooker. It is just a selection and every time I publish a new recipe, you will find it here.